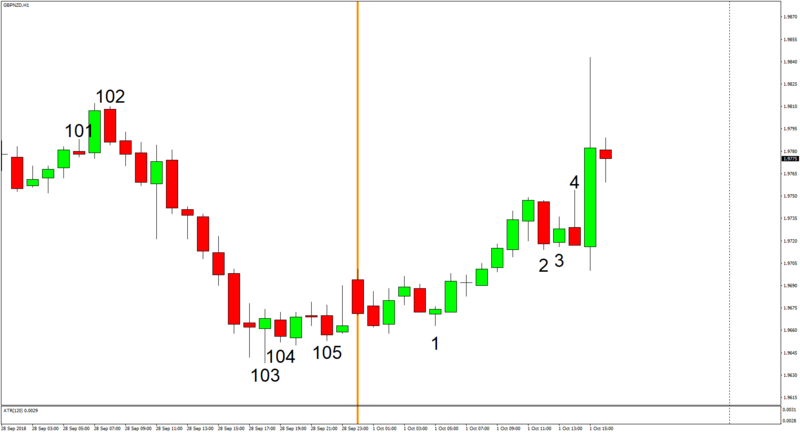 As you can see below, GBP/NZD traded higher on October 1, so all three open trades from last week (trades # 103, 104, and 105) were closed out with some gains. And if you’re wondering, they were all closed when October’s trade # 4 (a short) was triggered. And since all trades opened in September have finally been closed, and since a new month has already begun, it’s therefore time for another monthly evaluation of the Happy Hunter Trading System. 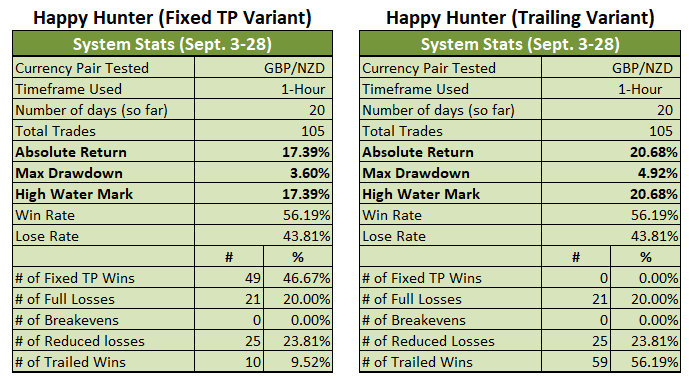 So, how did the Happy Hunter Trading System fare after eight months of forward testing? Well, regular readers probably already know that both Variants had another good month, but go ahead and click on the relevant jump links below for the deets. 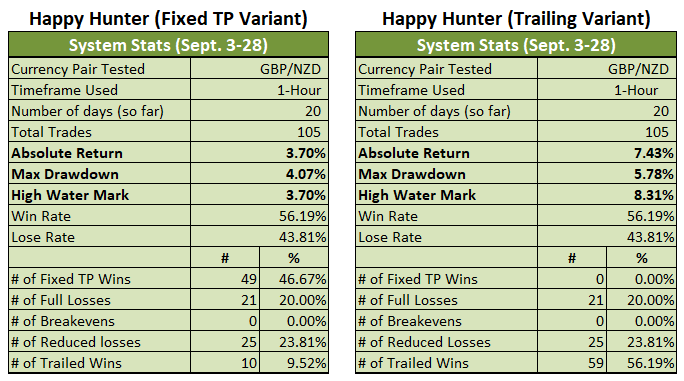 Both Variants of the (very) Happy Hunter Trading System had another good run in September since the Fixed TP Variant was able to capture 3.70% in gains, while the Trailing Variant harvested a bountiful 7.43% in gains. And we can thank the mostly favorable trading conditions in September for that. As long-time readers already know, the Happy Hunter is essentially a momentum-based trading system. It therefore needs volatility and directional movement in order to thrive. Well, volatility was certainly elevated since the average daily range in September was 167 pips. That’s lower than GBP/NZD’s historical average of 225 pips, but it’s higher than the 151 average for the entire forward testing period. 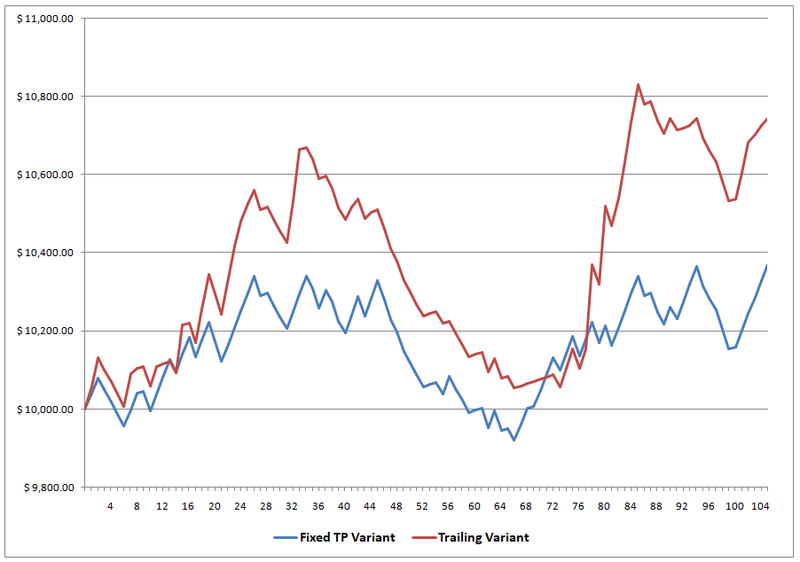 As for directional movement, there were decent trends that lasted for an entire day or two, which is why the Trailing Variant outperformed the Fixed TP Variant yet again. 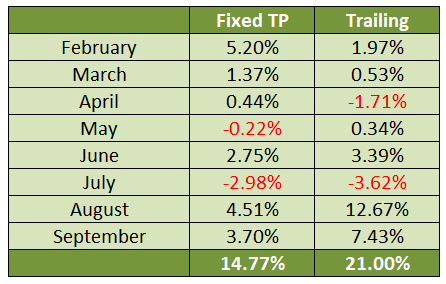 There were also periods of sideways price action, though, with the choppy, sideways price action during the second week of September being the worst, so much so that both Variants went into losing streak and the Fixed TP Variant even briefly entered negative territory. However, those periods of choppy, sideways price action were preceded or followed by periods of strong directional movement, so both Variants were able to quickly recover (and then some). As a side note, the gains captured in September mean that both Variants are now printing very impressive numbers for the entire forward testing period. 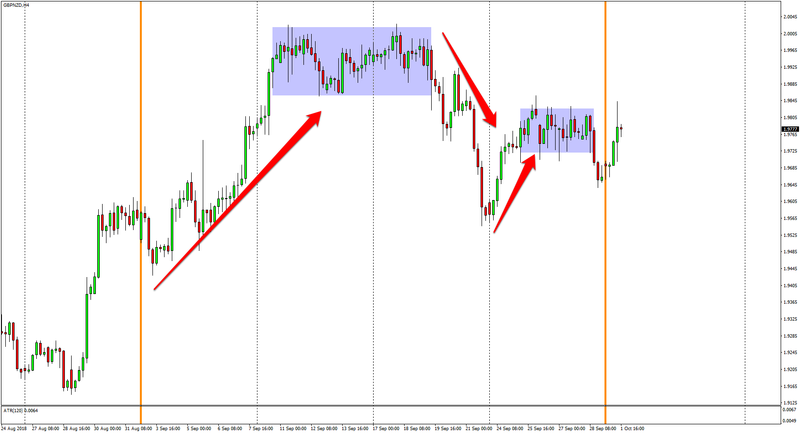 And again, do remember that we assume a fixed 12-pip spread in all trades. And as usual, here’s how the system would have fared if we lived in a fantasy, zero-spread world. Spread has a very big effect on the system’s performance, huh? On another side note, the ascending triangle I identified back in July finally broke to the topside, which explains the elevated volatility levels. 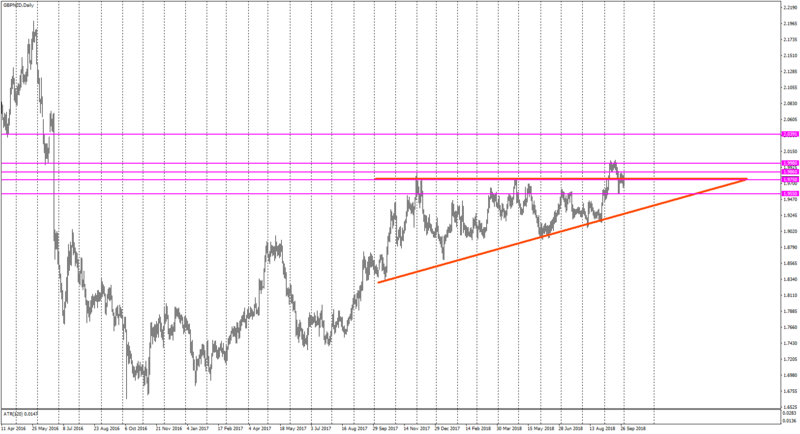 However, bears have entrenched themselves at 1.9980 and pushed the pair back inside the triangle. Bulls are fighting back, though. I just hope that means more volatility in October. Okay, it’s time to give the actual verdict. And as a refresher, here are the main goals I had for the system when I laid down my plans in My 2018 Trading Resolution way back in January. Again, let me just reiterate that monthly growth targets are not listed in my goals since the system is still in the forward-testing phase. As usual, both variants did not exceed the 20% drawdown threshold and both of them didn’t even come close to touching the 10% “panic level” so both Variants easily met that goal. Also as usual, I’ll just skip the goal to have a reward-to-risk ratio of 1:1 or better since that’s not really applicable. However, it’s worth pointing out that both Variants have a win rate above 50%, so they’re meeting one of my bonus goals. Well, that goal was actually not met when the system went into a very painful losing streak back in July, but, hey, it’s worth pointing out that the system’s win rate is back above 50% again. Moving on to the third goal, there was at least one trade per day in September, so we can easily check the third goal off our list. And for fourth goal, that’s still in progress and we won’t know until next year. 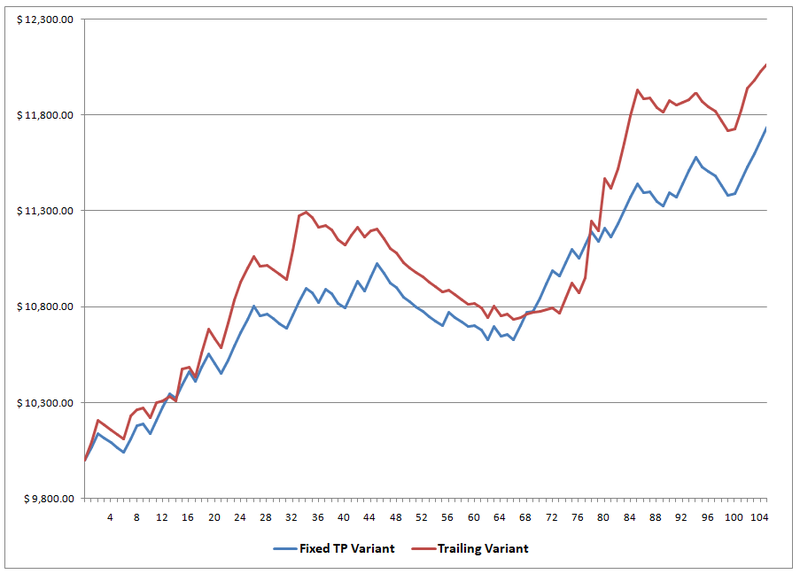 But as you saw earlier, the Fixed TP Variant is up by 14.96% for the entire forward testing period, while the Trailing Variant is up by 21.19%. It’s therefore very likely that both Variants will meet the fourth goal of closing out the year in positive territory. As for the fifth goal to have a winning month (each month, every month), well, you probably saw that both Variants already invalidated that goal before the terrible month of July. To sum up, both Variants are still doing very well since both Variants are still meeting my critical goals, with the exception of my goal to have a winning month every month. Both Variants are also on track to closing out the forward testing phase with some gains, although it’s worth stressing that I don’t have growth targets for both Variants.